* Brown (WG) - Was not a member of the original 6 Sept 44 crew. (KIA-POW) - On 11 Oct 44 mission #255 to Wesseling, Germany in B-17G #43-38200 (no name) (358th BS) VK-E. No fighter attacks. Intense and extremely accurate flak encountered at Wesseling with chaff having no effect on anti-aircraft fire accuracy. The 44 303rd BG(H) B-17s attacking target had 19 instances of major and 10 of minor damage and 10 crewmen wounded. B-17 #43-38200 received a direct flak hit between the #1 and #2 engines. It was seen to smoke immediately, pulled off to the left, went down in a steep dive, exploded at about 15,000 feet and crashed near Wesseling. 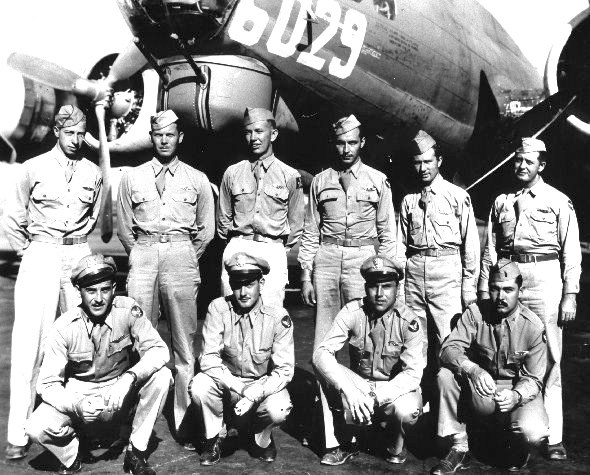 The KIA crewmen were killed in the explosion of their B-17. Anderson (N-POW) - Lt Anderson related that he was blown out of the nose and landed in a farmer's field. The English speaking farmer took him to Wehrmact. The farmer had been an American POW during WWI and had been well treated. Lt Anderson believes that he owes his life to Major Hobart Steely, 358th BS Squadron Navigator who advised Navigator to always wear their parachutes with at least one side hooked because you might not have time to put it on. He was so right. The Germans called Lt Anderson a terror flyer and a Chicago gangster because his home town was Hammond, IN next door to Chicago. The interrogators had personal information from USA Newspapers. Was sent to Stalag II - South Compound in Sagan, Germany. Remained at Stalag II until the January 1945 forced march of 50 km. Were then loaded into 40x8 box cars and transported over three days to Stalag VIIA at Mooseburg, Germany. Was liberated by General Paton's Army in early May 1945.